Adhugo Movie Review Adugo Telugu Film Rating Ravi Babu Nabha Venkatesh Mr B....! #Adhugo Movie Review and Rating. Ravi Babu latest directorial venture Adugo released this week as deepavali special. #AdhugoReview out now. Ravi Babu, an eminent director of Tollywood who is famous for his versatility. The films he chooses ranges from comedy (Like Allari & Party) to thrillers (like Anasuya). The director had always redefining Tollywood movies and he is coming up with another experiment called Adhugo. Adghugo, is Ravi Babu's film produced by Suresh Productions. It is a film about a cute piglet, as a protagonist. Story: 0:55 Review: 1:44 Rating: 8:31 The thing worth speaking about this film is that, this semi live action and semi animation project Adhugo, had gone into production 3 years ago itself. The movie was finally presented by Rana Daggubati and he is not just the reason for the hype behind Adhugo. 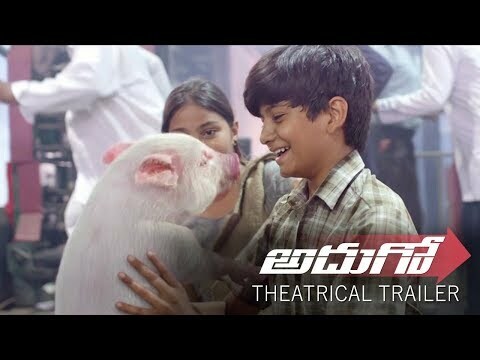 The film’s crew state that, Tollywood had hardly experimented unconventional films and Adhugo, having Bunty, a piglet as it’s protagonist, is definitely roping audiences into curiosity. Ravi Babu states that this film will change the audience’s perception towards pigs and Bunty’s screen presence will be absolute fun to watch. The director Ravi Babu had done interesting research before taking Adhugo onto the sets. My news sources confirm that, Ravi Babu had adopted piglet and started observing it’s behavior and characteristics. It is not unbelievable to tell that Ravi Babu wanted to cast a real piglet has his protagonist. After they realized that animating Bunty was easier than handling a real piglet, the film unit had decided to make Adhugo into a semi-animated film. What makes us more excited about Adhugo is that the voice over for the piglet Bunty, was given by Rajendra Prasad. Apart from Ravi Babu, Nabha Natesh (who debuted in Nannu Dochukunduvate) and Abhishek Varma have acted in this film. A song done by Ravi Babu’s friend, Actress Poorna, (who has been the lead female role of his previous films, The Avunu Movie Series and Laddu Babu) is supposed to set theatres on fire apparently. Adhugo’s story narrates forward as, Bunty a cute piglet gets lost through a courier and and the lead pair, who were reaching out for a puppy, get their hands on it. Bunty leaves it’s home for the first time and encounters a lot of people on it’s journey, apart from the lead roles, which is what makes this film’s story a journey of a piglet. This is the also the time when Sixpack Shankar(Ravi Babu) and a few other gangs chase the piglet for reasons (we are not going reveal). Things turn chaotic when the gangs falliung behind Bunty, make their encounters into a ruckus. Does Bunty get back home and how does it escapes all these notorious gangsters is the plot of the movie Adhugo. Ravi Babu plays the role of 6-pack Shankar which is fascinating to watch. The dosage of humor in the film Adhugo was sprinkled decently and a couple of artist’s performance will keep your belly wriggling. The VFX output for the dedicated budget is definitely combined with the three years of planning and effort. For the full movie review of Ravi Babu’s 2018 Adhugo, do watch the video. Stay tuned To Mr B for in depth Telugu, Tamil and Hindi movie analysis, break down, rating and dissection of films. Wishing Rana Daggubati, Ravi Babu and the entire crew of Adhugo - a huge success! Subscribe to Mr B for bold Tollywood and Kollywood movie reviews.